Experience the NEW Delta Orlando Lake Buena Vista! Our hotel focuses on the details, while blending the excitement of the areas most sought-after entertainment with luxurious accommodations skillfully designed to meet the needs of the next gen savvy travelers. Our Orlando hotel is just around the corner from popular Disney Springs, and we are the closest non-Disney hotel to the Walt Disney World Resort . A proud Disney Good Neighbor Hotel, Delta Orlando Lake Buena Vista features onsite parking, complimentary high-speed wireless internet, 24/7 fitness center, outdoor swimming pool, kids game room, and complimentary scheduled transportation to and from Walt Disney World Parks. Dining is no further than a few steps away from your room at D Flats, featuring flat breads and locally sourced craft taps or your favorite wine. Our dining options are also offered by delivery to your room or poolside by our large outdoor pool. 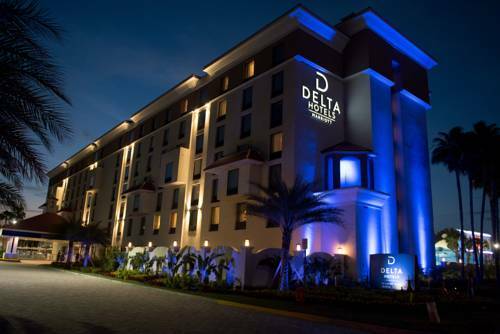 Book Delta Orlando and experience an alternative to "typical" in Orlando! Enjoy locally sourced craft tap, flat breads, and delicious meals all on the first level of the hotel. Delivery also available to your guest room or poolside! Start the day off right and enjoy an amazing breakfast before you get on your way. Opened in 2002. Has its own lake. View the first pair of water skis and other artifacts; experience the audio and video displays.